City officials made headway cleaning up Wednesday after a historic snowstorm in southwestern Alberta brought traffic to a standstill and left dozens of motorists stranded in their vehicles for hours. In what turned out to be Calgary’s snowiest October day in 104 years, southwest Alberta was hit with as much as 40 centimetres of snow on Tuesday, causing a mess on the roads that continued through the night. John Archer, a spokesperson for the Ministry of Transportation, called the conditions “severe” after the QE2 Highway was temporarily shut down following a fatal collision involving as many as 30 vehicles in Carstairs, Alta. Tuesday. There were several other minor collisions were also reported on Tuesday. 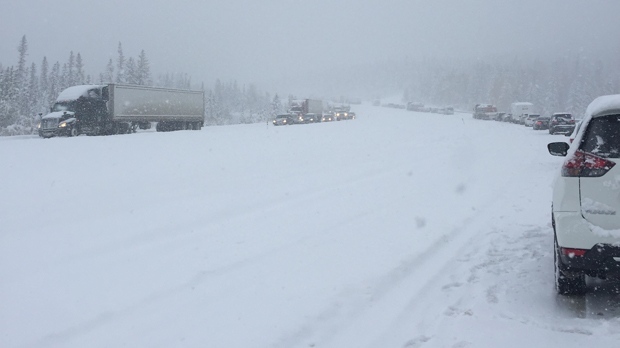 Travelers on Highway 1 were stranded on the roadway for more than 13 hours because of poor weather conditions. By Wednesday afternoon, both the westbound and eastbound lanes for Highway 1, near Canmore, Alta., had reopened. To help with snow clearing, 60 plow operators from Edmonton made the trip south and are expected to remain in Calgary until Wednesday evening. Chief Tom Sampson of the Calgary Emergency Management Agency said that measures like that don’t happen often but he was pleased with the comraderie. “Couldn’t be a prouder day to be a city employee, the way people worked through the night to ensure that we’re ensuring better service today,” he said in a news conferenceWednesday. Sampson added that it was “remarkable” to see how residents were lending help to neighbours.“Calgarians have been helping Calgarians dig out. It’s been remarkable. From homeowners to businesses—they’ve been doing great work,” he said. Sampson asked residents to make sure they weren’t shoveling snow onto the street and to clearsnow from furnaces and storm drains. Troy McLeod, the city’s director of roads, reminded residents to keep their cars off the street because of a 72-hour parking ban. “We’ve had a record snowfall event … with some areas getting 45 centimetres. When in October, we normally receive 10 cm in an entire month,” he said. Southwestern Alberta is no longer under a snowfall warning as the storm appears to have shifted east, where another four centimetres of snow is expected by Wednesday night. The morning commute was a slow go after heavy,wet snow fell on the city on Tuesday morning.